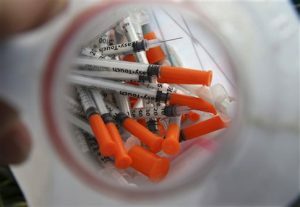 Washington Free Beacon Mexican Drug Cartels Driving Heroin, Opioid Consumption in U.S.
Mexican Drug Cartels Driving Heroin, Opioid Consumption in U.S.
Mexican drug cartels overwhelmingly are driving heroin consumption in the United States, which is now at a historic high, the State Department said in a report released Thursday. An estimated 90 to 94 percent of all heroin consumed in the United States comes from Mexico, a problem that has been exacerbated by an increase in the trafficking of fentanyl, a powerful synthetic opioid, by the same Mexican drug cartels that move heroine and cocaine into America, according to the State Department. William Brownfield, assistant secretary of state for international narcotics and law enforcement affairs, told reporters on a call Thursday that fentanyl is proving attractive to Mexican cartels because it is a low-cost, easily scalable drug to smuggle across the U.S.-Mexican border. Drug traffickers are able to increase the potency of heroine they bring into the United States by lacing it with fentanyl at a low cost, making the drug "exceptionally dangerous" in America, according to Brownfield. "Fentanyl is 10 to 50 times as potent as heroine and when the user does not realize that he or she is consuming fentanyl and not consuming heroine the likelihood of overdose and death is extremely increased," he said. "In fact, there have been times … in certain cities, Chicago comes to mind, where in a single evening, due to a poorly advertised batch of fentanyl, we lost more than 30 people in a single night." The State Department estimated that drug traffickers could pack 100 doses of fentanyl into a package the size of a cigarette box, making it extremely difficult for law enforcement officers to detect. FBI Director James Comey told an audience outside of Richmond, Virginia on Wednesday that Mexican drug cartels have cut overhead costs by ramping up heroine production in Mexico instead of relying on production in South America. Comey said the reduction in transportation costs has enabled traffickers to lower the price of heroin for consumers in the United States. Demand for heroin and opioids in the United States has increased dramatically over the last two decades. Opium poppy cultivation in Mexico is also on the rise. The State Department report says the "historic" heroin and opioid crisis in the United States affects millions of American citizens both directly and indirectly. According to the latest numbers from the Centers for Disease Control and Prevention, illicit opioids such as heroine accounted for over 33,000 overdose deaths in 2015, a four-fold increase from 1999. Brownfield said fighting the drug crisis in the United States requires a complex solution that involves bilateral cooperation with Mexico through mechanisms such as the Merida Initiative, a security agreement that aims to combat drug trafficking and transnational organized crime.